BUENOS AIRES, Feb 21 2013 (IPS) - It’s carnival time in sunny northwest Argentina, and as usual, food vending carts are everywhere. But some of the carts are different this year: they offer food cooked on the spot – by the sun. 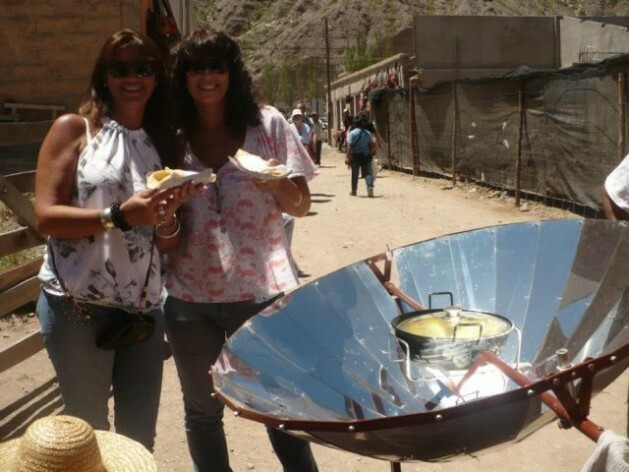 During carnival festivities in the Andean highland region of La Puna, which last almost the whole month of February, local promoters of solar power have introduced a fleet of innovative mobile “solar kiosks” in Tilcara, Humahuaca, La Quiaca, Purmamarca and Uquía, popular tourist destinations in the northern Argentine province of Jujuy. Each kiosk consists of a cart with wheels and a waterproof roof, equipped with a solar-powered parabolic cooker that is essentially a large, curved aluminium dish, resembling a satellite dish, with brackets in the middle to hold the recipients where the food is cooked. We want it to be a healthy alternative. We don’t want it to end up in the hands of any old vendor who will use it to sell hot dogs and French fries. “People are sceptical at first, but once they try it, they are amazed,” said Marta Rojas, who runs a solar kiosk inaugurated this month in Tilcara, the picturesque old city that is the epicentre of carnival festivities. “They need to touch the dish to believe it, and they end up burning themselves,” she laughed. The carts are also equipped with a two-kilo tank of propane gas for cooking at night or on overcast days, a water dispenser, a cooler, advertising signs and kitchen utensils. The driving force behind the initiative is the EcoAndina Foundation, which has been working for the last 25 years on the development of various devices to take advantage of the abundant sunlight in this arid region, where water and vegetation are scarce and swings in temperature between day and night are extreme. Rojas, a schoolteacher, took one of the solar-powered cooking courses offered by EcoAndina and decided to take the plunge and run a food cart during carnival season. The foundation provides the carts at a subsidised price, because showing them in action is much more effective than simply displaying them, she told IPS. “So far we’ve made vegetarian pizza and quinoa turnovers. We’ve attracted a lot of vegetarian tourists, who take pamphlets with them,” she said. “But we’ve also roasted a kid goat with potatoes,” she added for the benefit of meat lovers. The region of La Puna, in northwest Jujuy, is one of the areas that receive the most solar radiation annually in the world, along with the neighbouring Bolivian Altiplano – which forms part of the same ecoregion – and the high plains of Tibet and Afghanistan. That makes it an ideal “laboratory” for experimenting with solar energy. So far, EcoAndina has installed around 900 solar energy units that are designed and assembled locally, including stoves and ovens for individual households and community kitchens, heaters and hot-water tanks, in more than 30 isolated towns in the region. Their efforts are backed by technical and financial support from the German embassy in Argentina and the German NGO Wisions, and are aimed at promoting sustainable development and employment through this clean, renewable energy source. Industrial design specialist Virginia Bauso is the inventor of the solar kiosks. Two years ago, she and her colleagues set out to promote solar power in Tilcara with a group who demonstrated how to make grilled sandwiches using the sun’s energy. “It was a success,” she told IPS. This led to the idea of designing a mobile food cart equipped with a solar cooker. “Since it is mainly women who run small businesses here, we targeted our efforts to them. In 2011 we started out with prototype carts, courses and street demonstrations,” she said. Since the beginning of 2013, a dozen carts have been launched in a number of different towns, taking advantage of the influx of Argentine and foreign tourists who come to take part in the area’s carnival festivities, a unique blend of indigenous, Spanish and locally developed myths and traditions. “We want it to be a healthy alternative. We don’t want it to end up in the hands of any old vendor who will use it to sell hot dogs and French fries. We make vegetable and quinoa stew, corn and onion tacos, things like that,” said Bauso. To drink, every solar kiosk offers hot or cold coca leaf tea, with lemon, cinnamon and sugar, which helps to alleviate “apunamiento” or altitude sickness, a common complaint since the region is between 2,700 and 4,600 metres above sea level. The women who run the food carts take advantage of the morning sun to cook with the highest power level available. It takes about 12 minutes to boil a litre of water. The aluminium parabolic reflector, which measures 1.2 metres in diameter, “can be a bit tricky to use,” said Bauso. It needs to be properly focused towards the sun and then gently moved away, or covered with a diffuser, to raise and lower the cooking temperature. Cast iron recipients work best for cooking, although aluminium can also be used. “The women generally prefer to bring their own pots and pans,” she added. At night or on cloudy days, food that has not been prepared in advance is cooked with propane gas. Every one of the kiosks serves as a “live” demonstration for the promotion of solar power, which is why each one also offers brochures printed up by EcoAndina. In this way, an alternative energy source that has been quietly developing in a handful of isolated towns in La Puna is becoming known in the rest of the country. This has led to expressions of interest from other provinces in Argentina, but Bauso believes that wide-scale expansion is still premature. “We still need to work on the cookers. We are putting together an instruction manual. We also don’t want just anyone to use them. We want them to be used by people who are genuinely interested in solar power, and in healthier, safer and more hygienic cooking,” she said. Argentina, a country with significant oil and natural gas reserves, also has enormous potential for the development of solar and wind power, which currently account for only 1.1 percent of energy production. And there is no lack of a need for alternative energy sources, especially in poor and isolated areas. “Many people in towns in the interior are interested in this technology because piped gas service doesn’t reach rural areas, bottled gas is expensive, and firewood is in ever shorter supply, which also reflects the growing problem of desertification,” explained Bauso. People in the arid region of La Puna have traditionally used three types of plants for firewood: the “tola” bush (Parastrephia lepidophylla), “queñoa” (Polylepis tarapacana), a high-altitude tree, and “yareta” (Azorella compacta), a cushion-shaped evergreen shrub. But these plants, which are also eaten by llamas, are becoming increasingly scarce, and people have to travel ever longer distances to find them. And their use is even beginning to be passed down from generation to generation. “People are buying solar cookers from us to give to their children as wedding presents,” reported Bauso. *This story was originally published by Latin American newspapers that are part of the Tierramérica network. Tierramérica is a specialised news service produced by IPS with the backing of the World Bank.